We are stranded in this big old Eastern storm. Holy snow, batman! Thank goodness we were able to get into a hotel on Friday and we're hoping to be able to head out again on Sunday, but I was looking through my future post file and forgot about these. I hope they're still at the dollar spot. You'll also needs some velcro~the only kind I had was with the sticky back. 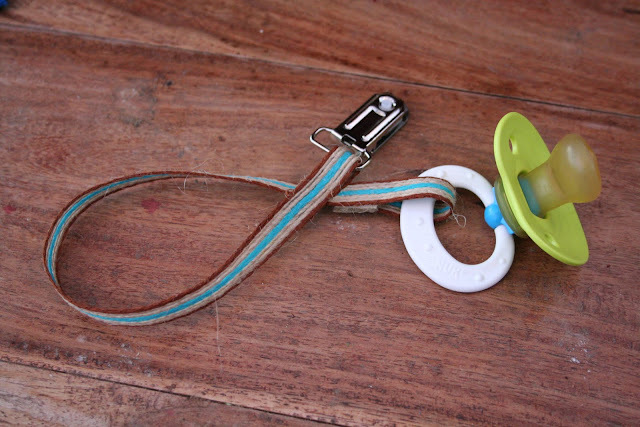 Cut the ribbon to the length you want for your binky holder. You don't want it too long for strangulation concerns. Hot glue a small piece of both sides of the velcro on to the ribbon. If you are a sewer, a few stitches would be even better. Cut the elastic off of the mitten holder and loop the ribbon through and secure it with hot glue or a few stitches. 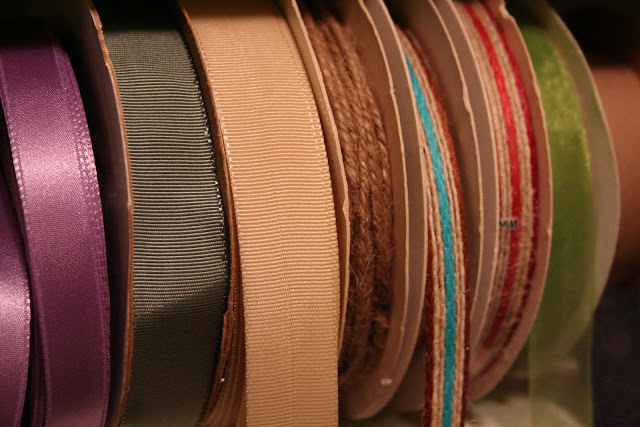 Now, if you are a mam mommy, could you thread the ribbon through one of the holes? For all of you caught in this storm, I hope you're staying warm, reading this because you have electricity, and enjoying the winter wonderland. Travel safely! I can't believe you're able to blog in the middle of a blizzard while in the middle of a move :). Stay warm and be safe out there! Great idea. Luckily I'm out of the binky phase with my boys. We're shut in by the same storm. 20+" and still coming down. I heard about that storm on the news. I am glad you are safe. Good luck with the rest of you move! That's a good idea. Those binkys fall on the germy floor all the time. Yuck. This will keep it clean. Yes, I'm snowed in. I spent the day baking and making fudge. I am so glad this blog can keep me posted of your whereabouts!! Glad you are safe, darling idea--wish I had a kid that took a binki longer than 3 months so that I needed some of these myself! Be safe! Loves! Another great use for them is jean stirrups! Just attach them the bottom of your jeans and put your feet in some boots! Saves you from having to stuff your jeans into socks then put on boots! I'm not in need of binky clips, but I can tell you that these make great emergency garter clips for thigh-high stockings. I have about four pairs of them in my lingerie drawer and I always take a Target set in my emergency kit for costume conventions. I am staying warm by staying inside. This Floridain is not use to the snow:( Where are you headed? Thanks for the heads up about Target! 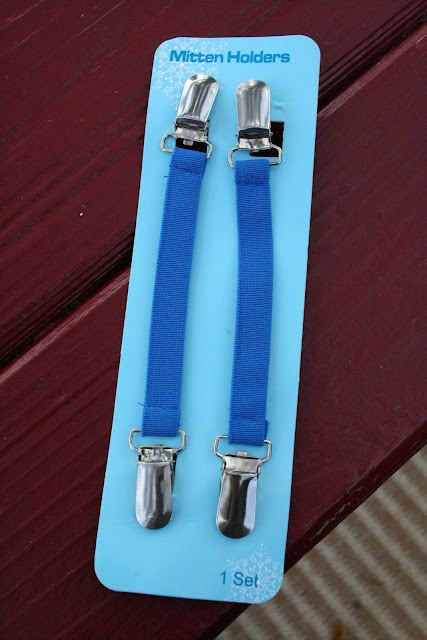 Last year I made some binky clips, so I don't need any right now, but I do need some mitten clips! Last night I was walking around Old Navy, looking for my little one's missing mitten! My plan is to find the sheet straps we have somewhere and see if those will work. If not, off to Target I go! Stay warm and travel safe! Cute cute cute! Yep, we've been stuck in it. My hubs literally risked his life yesterday to drive to the Richmond airport to pick my sis up. Miraculously, AA and Richmond kept those flights open and she made it in. Took them hours to make it home, but it was so nice to have her here. We have well over a foot of snow. Got out this afternoon and made it to Target. ;) Hope you are safe!!! Aw, you're making me miss my babies with those binky shots. 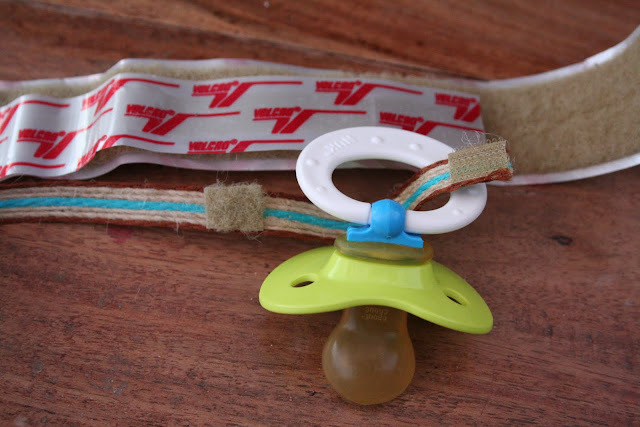 I loved binky clips and couldn't live without them. Coulda used this tutorial about four years ago ! They're fab ! So here we are in the East, with nary a snowflake to our name. Oh, well. Hope you got out on Sunday. Will you be in your house before Thursday? You've been on my heart so much! That is too cute! We got stuck in the storm too!!! Have a safe rest-of-the-trip! You will remember this adventure forever no doubt! I am hoping my guy LOSES his pacis...it's about time...but love the tutorial!